Today is the feast day of one of the greatest Doctors of the Church, St Therese of the Child Jesus and the Holy Face. She wrote her own autobiography entitled, "Story of a Soul." 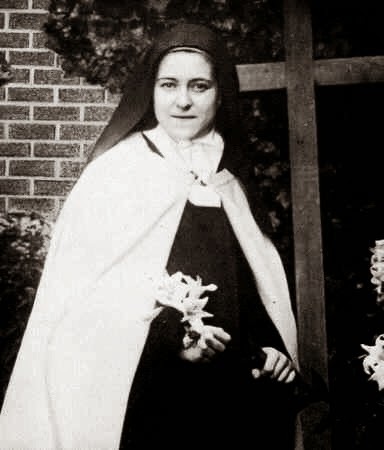 St. Therese was born Marie Francoise Martin in Alencon, France on January 2, 1873. She was one of nine children born of Louis and Zelie Martin. Due to the poor medicine at the time, four of the children passed away. Her old sisters, Marie, Pauline, and Celine entered the Carmelite order in Lisieux. Therese would later follow in their steps and become a Carmelite herself. In 1883, Therese is said to have been cured by the Blessed Virgin Mary after she suffered from an unknown illness. It is during this time that she describes receiving the grace of conversion. She felt the need to focus on others instead of herself. Because of this, Therese wanted earnestly to enter the convent. However, the law did not allow for her to enter at the age of fifteen. She was so determined that she asked Pope Leo XII himself to enter the order of Carmel. Therese felt called to be a missionary and to save souls while praying for priests. She received permission to enter the convent at an young age and become a Carmelite. For some time, she found religious life a bit difficult. There was a particular sister who gave her a hard time. Nevertheless, she did not give up and persevered. Therese lived a life of silence, prayer and work. She took everything as a blessing from God and even became pen pals with a seminarian named Maurice. Both would build a great friendship via ink. Therese would later contract tuberculosis in 1896 and suffered greatly because of it. During this time she face doubts and even was atheistic for a time. She doubted if God really existed, if heaven existed and if she had wasted her life in religious life. She died on September 30, 1897 and was canonized in 1925. Her journal sold out worldwide a year after her death. Her way of being is described as the "Little Way." She believed in doing small things for Christ and that Christ wants us to be like children trusting and hopeful. Her body lays in state and is incorrupt. She is a very popular saint today and promised to spend her heaven doing good on earth. When God grants favors via her intercession to Christ, a rose often appears.